Will the HP Envy m4 make you the envy of your m8s? HP has announced a trio of new Windows 8 laptops, including a beefed up HP Envy M4 and two Sleekbook notebooks. The M4 is the cream of this particular crop, with its brushed-aluminium looks and 14-inch HD display housing a third-gen Intel Core processor and optional Wi-Di for purshing HD images and videos to an external display wirelessly. HP's Beats love continues apace with the Envy m4 offering a subwoofer and two speakers to make the most of Dre's audio enhancements. And, as usual, there's a bunch of additional features with terrible names like HP's ProtectSmart that helps prevent data loss if you drop your laptop, as well as a cooling system and some extra security know-how. If that sounds like something you need in your life, the HP Envy M4 is set for release on October 26 (three guesses what OS it'll be running), with a US price of $899.99 (around £555 but UK pricing is TBC). 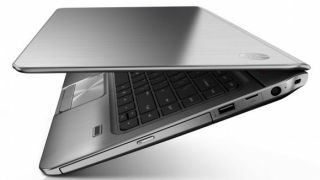 The lower-priced, lower-specced options are the HP Pavilion Sleekbook 14 and 15, which HP is touting as 'ultrathin' in style. Available in "sparkling black" and "ruby red", the 14- and 15-inch laptops come with optional bumps like up to 1TB of storage. Both models offer Nvidia graphics, but the 14-inch edition is rocking an AMD processor, while the 15-incher comes with Intel innards with hyper-threading technology to aid multi-tasking. The HP Pavilion Sleekbook 14 and 15 PCs will start at $499.99 (around £310) and $559.99 (about £350), respectively and should hit the US on October 26. We've spoken to HP which confirms that the new laptops will be making their way to the UK, although pricing and availability are yet to be confirmed. Stay tuned. Update: UK pricing for the two Sleekbooks has now been confirmed; the HP Pavilion Sleekbook 14 and 15 PCs start at £429 and will be available from October.